Every Punk is a sap. I would like to take credit for this revelation but alas it was my wife who made me aware of this fact and it is a fact. While listening to Social Distortion she turned to me and said “Mike Ness is a total sap, all he writes are love songs …all you boys are a bunch of saps” and instead of getting defensive about the statement i found that I had no choice but to COMPLETELY agree with her. Not because she’s my wife but because she hit the nail on the head. We are all pure, unabashed sentimentalists. Some people wear their hearts on their sleeves but we wear them as badges and flashing neon lights hanging over our heads. 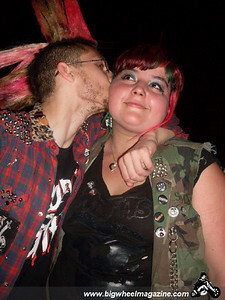 Love, passion and romance are the true foundations of Punk rock. “What the hell? What about anarchy, dissent, nonconformity, youthful alienation, straight up anger at the system! Black Flag didn’t write no love songs! Has this dude gone totally EMO on us” Well before anyone suffers a brain aneurysm… take a deep breath and keep reading. If any one remembers the dreaded E word is short for emotional and Punk rock at its very core is all about pure raw emotions. As far as I’m concerned anything worth doing has to be done first and foremost out of love. If you don’t love something then your in it for the wrong reasons. You can fake attitude you can fake anger but you can’t fake love. Most of us got into this because Punk spoke to our emotions and we continue to do it because we love it. So I’m not really talking about boy meets girl LOVE SONGS, am I? Well yes and no. Because some of our best loved bands most revered songs are indeed love songs. I mean check out the Buzzcocks, Descendents, Screeching Weasel the list could go on forever. All of them purveyors of love songs but still loud fast and occasionally pissed off. Without passion and romance we wouldn’t have had The Clash and if we didn’t have The Clash who knows where any of us would be. Every garbled word that was ever spit out of Joe Strummers mouth was formed from passion and romance. You could tell he not only meant everything he ever sang, he felt it in his soul. Every guitar lick laid down by Mick Jones was obviously the work of someone in love. Safe European Home sprang from a romanticized version of Jamaica held by four white kids in London. Stay Free and White Man in Hammersmith Palais are true love songs by any definition. Underneath the politics, rebellion and sloganeering beat an actual heart. So while few of us have ever slow danced to Clash at the prom, its obvious they were all about love. Yeah they shouted Hate and War but but the conviction with which they shouted it came from a different place.